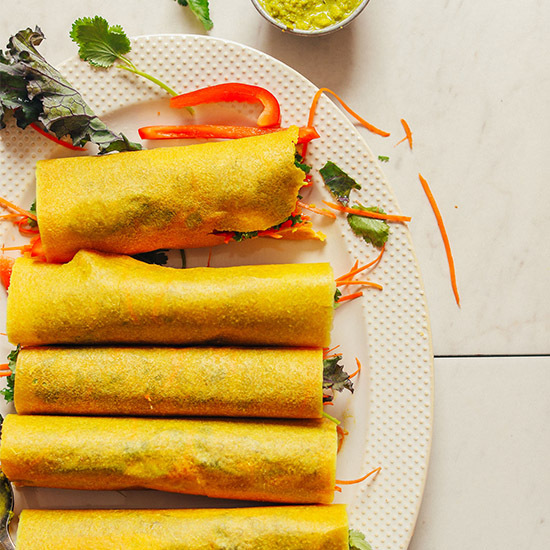 These veggie coconut wraps have our heart. Not only are they easy to make, requiring just 8 ingredients and 5 minutes to prepare, they are the ideal easy lunch or snack! Let us show you how. 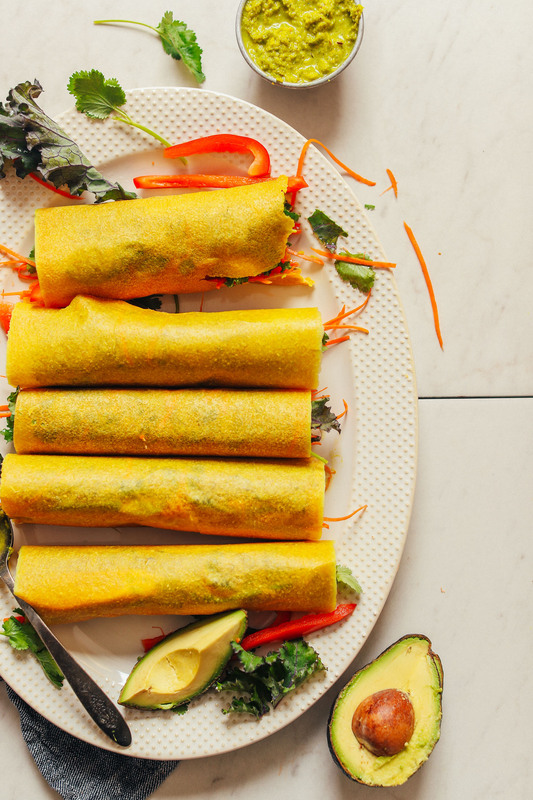 We were turned onto these Coconut Wraps* by Sarah’s Day. After ordering them and trying them for ourselves, we were hooked! They’re made with 4 simple ingredients and quite versatile. Enjoy them cooked or raw (we prefer raw), savory or sweet (we prefer savory). While the wraps themselves are delicious, the fillings are where it’s at. We went with hummus and our beloved Green Curry paste for sauce and plenty of fresh vegetables. 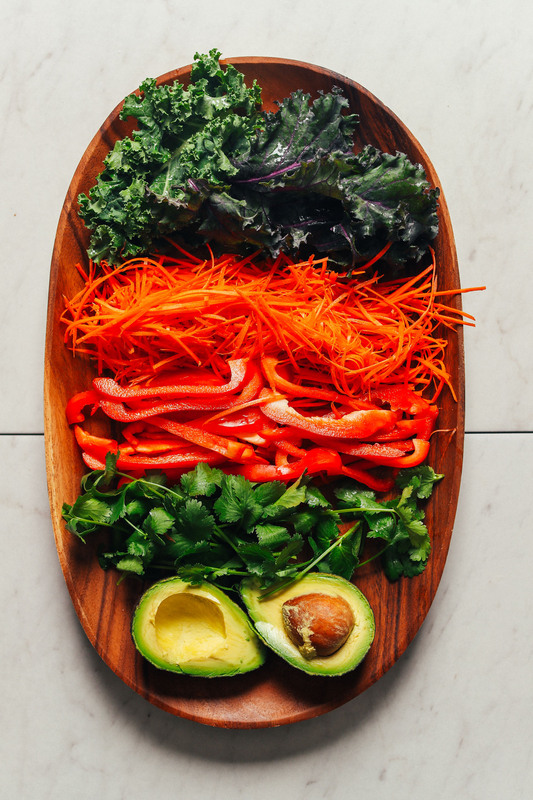 Red bell pepper, carrots, creamy avocado, crispy kale, and cilantro are packed in tight and marry well with the hummus and green curry paste. Total swoon! These are the ultimate quick and delicious snack or lunch. We’ve been enjoying one or two alongside a big green salad for the ultimate midday treat. We haven’t tried many other fillings for the wraps because this version is so tasty. But feel free to substitute what’s in season and available near you. 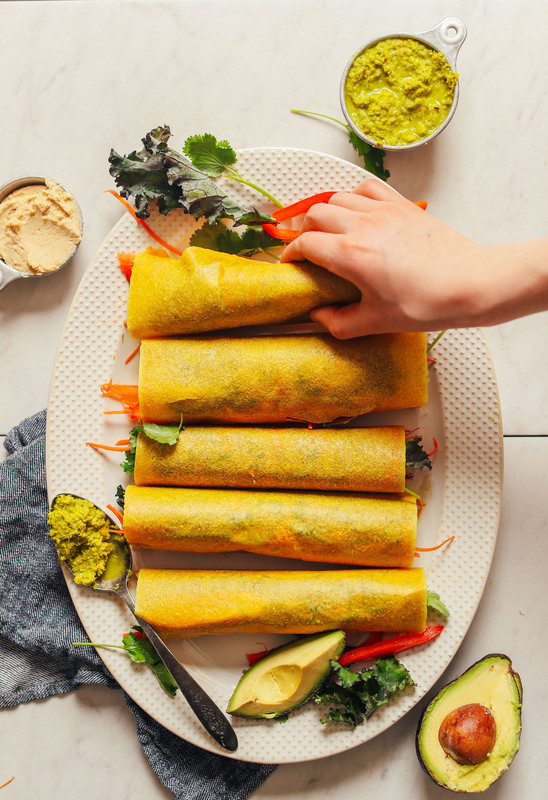 If you’re into wraps, also be sure to check out our Thai Spring Rolls with Cashew Dipping Sauce, Spicy Buffalo Chickpea Wraps, Vegan Sweet Potato Chickpea Wraps, and Rainbow Chard Hummus Wraps! 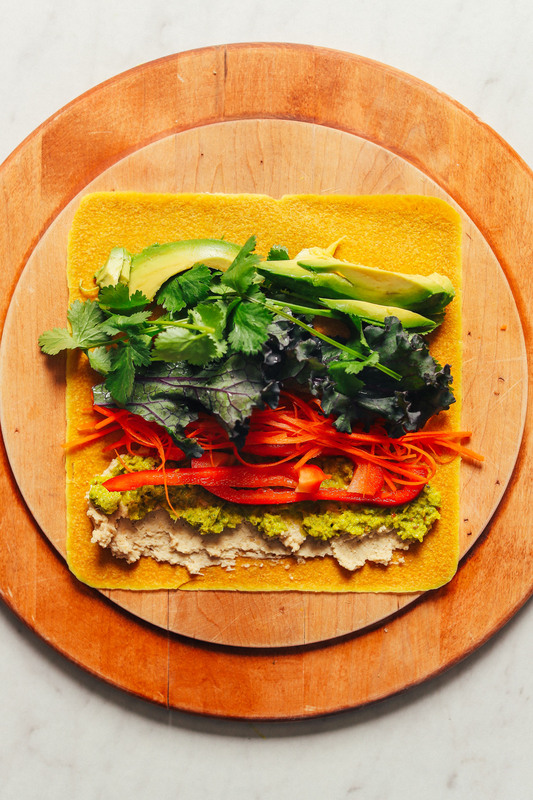 An easy, incredibly fresh and delicious lunch or snack idea: Grain-free coconut wraps with hummus, curry paste, and tons of fresh vegetables. Just 8 ingredients and 5 minutes required. Lay a single coconut wrap on a clean surface or cutting board. Add 2 Tbsp (~32 g) hummus and 1 1/2 Tbsp curry paste (~22 g) and spread on the end of the wrap closest to you. Add bell pepper, carrots, avocado, kale, and cilantro and roll tightly away from you. Place seam side down on a serving platter. Repeat until you have 5 coconut wraps (or as many as you desire). Best served fresh. Can store leftovers covered in refrigerator up to 1 day. *If you can’t get your hands on coconut wraps, feel free to substitute something similar, such as almond flour tortillas or flatbread. The toppings would also work well as a veggie sandwich on toasted bread. *Be sure to keep your coconut wraps well sealed for freshness. And if they are dry or brittle, try wrapping in a damp, warm towel to rehydrate and soften. *Prep time does not include making green curry paste or hummus. *Nutrition information is a rough estimate based on 1 of 5 servings. *This post is not sponsored. We don’t accept free products or do sponsored content on Minimalist Baker. You can read more about that on our about page.